: Hunting dog used for hunting the hare, the roedeer, the fox and sometimes the boar. He hunts in an independent manner giving tongue. Even on difficult terrains, searches and hunts with great determination. : The Swiss Hound has very ancient origins. His presence in times of the Roman Helvetia is certified on a mosaic, discovered at Avenches, by the representation of packhounds corresponding to the varieties of Swiss hounds. In the XVth century, he was sought after by Italian dog lovers and in the XVIIIth century, by the French, for his exceptional aptitude for hunting the hare. His native lines have certainly been influenced by scenthounds of French breeding brought back to Switzerland by mercenaries. 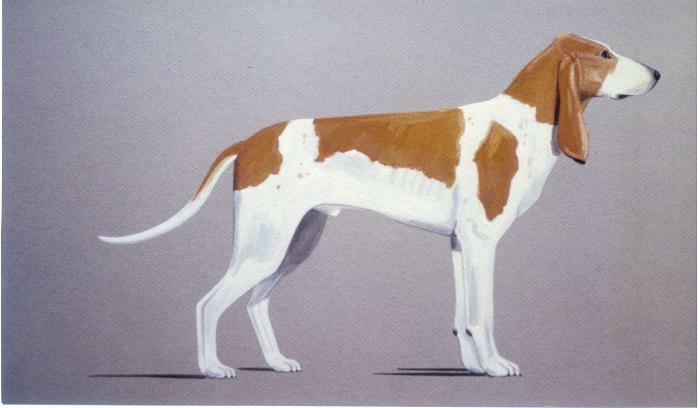 In 1882, a standard was established for each of the five varieties of the Swiss Hound. In 1909, those standards were revised and the total disappearance of the hound of Thurgovie was noted. 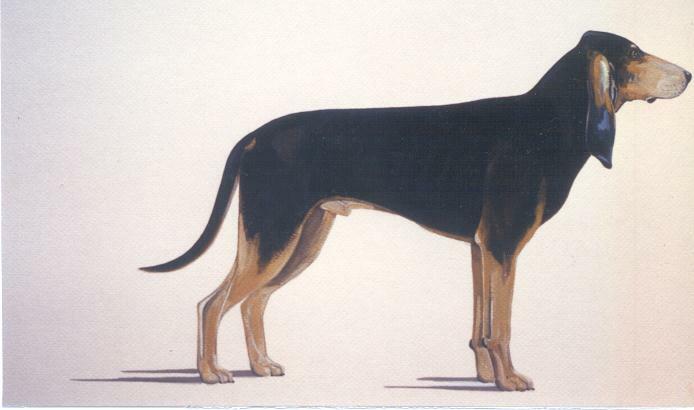 On 22nd of January 1933, one single standard was established for the 4 varieties of the Swiss Hound. The ancient variety, the hound of the Jura type St. Hubert, has in the meantime disappeared. : Medium size, good conformation indicating strength and endurance; lean head and long muzzle with long leathers giving an air of nobility. There are 4 varieties of the Swiss Hound: Bernese Hound, Jura Hound, Lucerne Hound, Schwyz Hound. Length of body / height at withers = about 1.15 / 1. Height at withers / depth of chest = about 2 / 1. Length of muzzle / length of skull = about 1 / 1.
: Lively and passionately keen on hunting, sensitive, docile and very attached to his master. : Elongated, narrow, lean, noble; rather rounded; occipal protuberance visible; axes of skull and muzzle slightly divergent. Absence of frontal furrow and wrinkles. : Completely black, well developed; nostrils wide open. : Finely chiselled, narrow, neither square nor pointed; nasal bridge straight or very slightly convex. : Moderately developed, upper lips covering the lower jaw closely; corner of the lips slightly open. : Jaws solid; teeth strong, complete and regular with a scissor bite, i.e. the back sides of the upper incisors are in close contact with the front face of the lower incisors; teeth squarely implanted into the jaws; pincer bite accepted; absence of one or two PM1 or PM2 (premolars 1 or 2) tolerated. The molars M3 are not taken into consideration. : Clean, zygomatic arches not prominent. : Dark or lighter brown corresponding to the colour of the coat, slightly oval, medium-sized, rims of eyelids well pigmented fitting perfectly the shape of the eyeball; soft expression. : Set on below the eye level and towards back of the skull, never attached in their greatest width; in length, reaching at least the tip of the nose; auricle not prominent; leathers narrow, drooping, folded and twisted, rounded at their tips, supple and covered with fine hair. : Elongated, elegant, muscular; skin loose at the throat, but without noticeable dewlap. : Neck, back, croup and tail should form an harmonious and noble outline. : Discretely defined, set-on of neck free and elegant. : Longish, in harmonious prolongation of the topline, slightly inclined. Not higher than withers. Hip bones not too prominent. : Deeper than wide, well let down and reaching at least the point of the elbows; thoracic cage carried well back, with slightly sprung ribs. : Underline: Slightly tucked up towards hindquarters; full flanks. : Set in prolongation of the croup, of medium length, elegant, tapering to its tip, forming slight upward curve; at rest or in slow gait mostly hanging without a distinctive curve; when the dog is attentive or is moving faster, it is carried higher than the back line, but never falling over the back or curled up; well covered with hair, but without any coarser slightly offstanding hairs. : Very muscular, lean, without heaviness. Seen from the front forelegs parallel, of medium bone structure; seen in profile standing vertical. Forefeet pointing straight ahead. : Shoulder blades long and oblique, well attached to the chest wall. Ideal angle of the scapular-humeral articulation about 100°. : A little longer than the shoulder blade, oblique, close to the chest. Fine musculature. : Naturally placed against the thoracic wall. : Relatively short; seen from the front, in the vertical line of the forearm; seen in profile, slightly inclined. : Of roundish shape; toes tight; pads rough and hard; nails solid and coloured according to the colour of the coat. : Roundish; toes tight; pads rough and hard; nails solid and coloured according to the coat colour. : Very muscular, but in harmonious relation to the forequarters; seen from behind straight and parallel. : Long, oblique, with strong, but flat muscles. Angle of the coxal-femoral articulation about 110°. : Neither turned out nor in. Angle of the femoral-tibial articulation about 120°. : Relatively long, muscles and tendons lean, apparent under the skin. 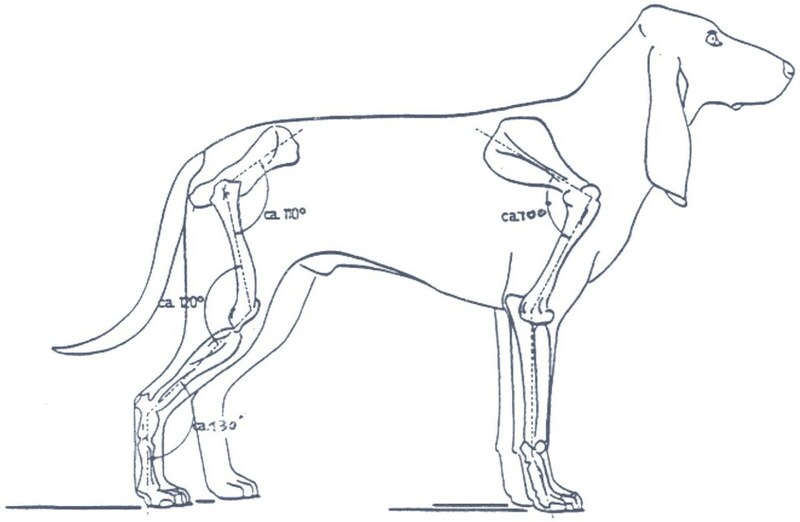 : Angle of the tibial-tarsal angulation about 130°. : Quite short, straight and parallel. Without dewclaws, except in countries where their removal is prohibited by law. : Movement easy, regular, coordinate and covering ground; powerful impulsion from the hindquarters; the legs move along parallel straight lines. The withers move up and down smoothly and regularly; the back should remain level; very slight lateral oscillation of the head and neck. Bernese Hound: Black skin under black coat, slightly white and black marbled under the white coat. Jura Hound: Black skin under black coat but lighter under tan coat. 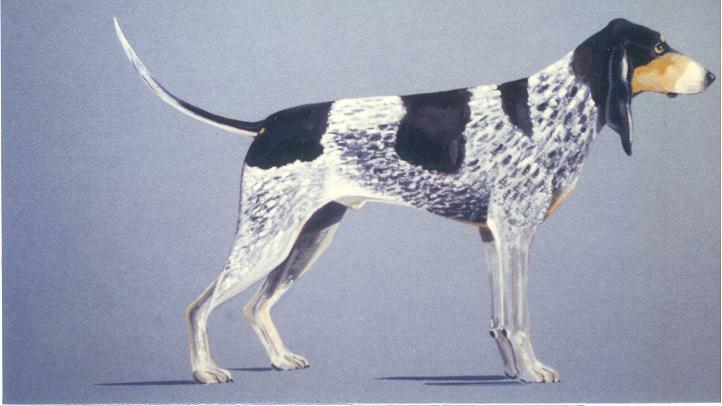 Lucerne Hound: Black skin under black coat and lighter under blue speckling. Schwyz Hound: Dark grey skin under orange coat and white and black marbled under the white coat. : Short; smooth and dense, very fine on head and leathers. Bernese Hound: White with black patches or black saddle; with light to dark tan markings over the eyes, on the cheeks, the inside of the leathers and around the vent; the white sometimes with very slight black ticking. 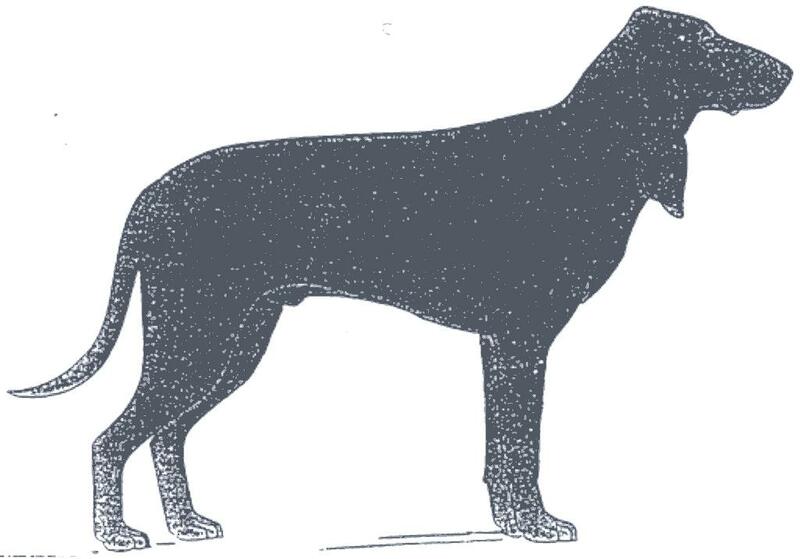 Jura Hound: Tan with black blanket, sometimes with black overlay; or black with tan markings over the eyes, on the cheeks, around the vent and on the legs; sometimes with a small white patch on the chest which may be slightly speckled (black or grey ticking). Lucerne Hound: “Blue” resulting from a combination of back hairs and white hairs, very heavily speckled; with black patches or black saddle; with light to dark tan markings above the eyes, on the cheeks, on the chest, around the vent and on the legs; a black blanket is admitted. Schwyz Hound: White with orange patches or orange saddle; the white sometimes with very slight orange ticking; an orange blanket is admitted. : No tolerance of undersize or oversize. Males 49 – 59 cm. Females 47 – 57 cm. Muzzle too short or too long, too square or too snipy. Absence of teeth other than 1 or 2 premolars (PM1 or PM2). The molars 3 (M3) are not taken into consideration. Eyes light, piercing expression; eyelid not close to the eyeball. Leathers too short, too thick, set on too high, carried flat. Croup too short or sloping too steeply. Chest not deep enough, too flat or barrel-shaped. Belly tucked up, hollow flanks. Tail badly set, carried too high, too curved, deviated, too coarse in shape; with coarser slightly offstanding hairs. Limbs too fine-boned or incorrectly placed. Shoulders too upright; upper arm too short. Insufficient angulation of hinquarters; cow hocked; bandy legs. Dewclaws on hindlegs (unless removal prohibited by law). Bernese Hound: Too many black ticks in the white. Tan or white colour on the outer side of the ear lobe. Jura Hound: Self coloured coat. Important white patch or strongly speckled white patch on chest. 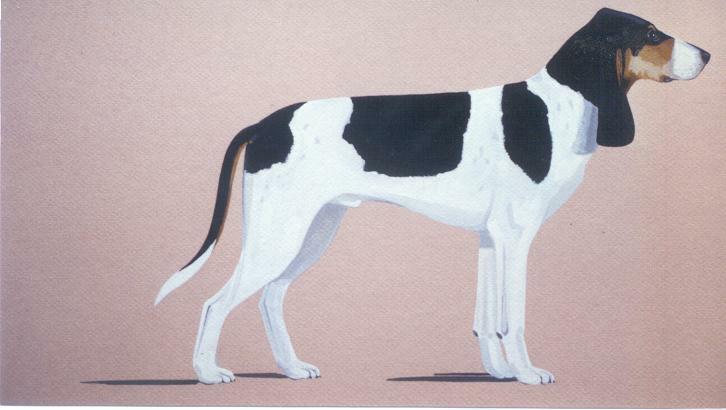 Lucerne Hound: Absence of “blue” speckle. Tan colour on the outer face of the ear lobe. Schwyz Hound: Too many orange flecks in the white. Self coloured coat. White colour on the outer side of the ear lobe. Slightly apprehensive or slightly sharp behaviour. General appearance coarse and lacking in distinction; weak general structure. 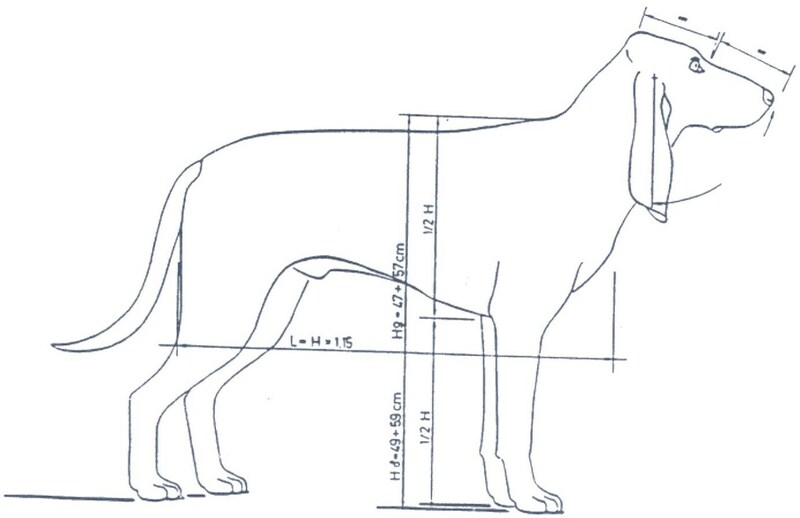 Disproportion between length of body, height at withers and depth of chest. Skull too broad, too rounded or too flat. General appearance lacking in breed type. Overshot or underhsot mouth, wry mouth. Ectropion, entropion (even if operated). Rolled or ring tail, hook tail; malformed knotted or fused tail. Size either over or under that fixed by the standard.